JFace Databinding enables an easy binding between values inside of data models and SWT/JFace widgets. No more boring listeners to implement – just create observables and connect them using the data binding context. There are several brilliant articles written about it. My favorites are those from Ralf Ebert and Lars Vogel. One of the interesting aspects of databinding is data validation. The update strategies, responsible for propagation of changes in models or in widgets can be supplied with validators, making sure that the data changes are legal. In the same time the JSR-303 Bean Validation specification focuses on a modern standardized way of data validation. In this post, I combine these subjects and use JSR-303 in JFace Databinding Validators. As a next step, let us develop an update strategy factory which create update strategies with embedded Validator for JSR-303 Bean Validation constaints. Development of Eclipse RCP as a rich client of the multi-tier Java Enterprise application becomes an an interesting alternative to other frontend technologies. An important aspect is the ability to develop and test the frontend independent from the backend. In this article, an approach for testing and de-coupling of server and client development in Eclipse RCP is introduced. * Full qualified name of the interface (used for Binding). * Does something on server. 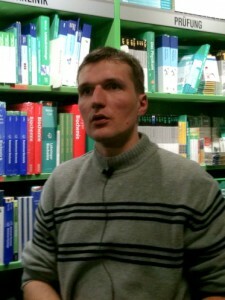 * @param parameter Parameter of invocation. * @return Result of execution. * Delegates a call to a stateless session bean on the server. The setup looks good in theory, but in fact it is pretty boring to program on the client side. You can reduce the effort of creating business delegates (in fact I use MDSD techniques and Xtext to generate it), but in every place a service is required, the business delegate is instantiated directly. The approach works, but it just not nice, because you reference the implementation directly. A common approach to avoid writing the code of direct instantiation is the usage of Dependency Injection frameworks. 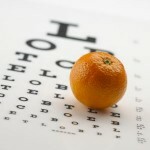 A very popular one is Google Guice, which is used in this article. The essential idea of Google Guice is to configure the binding between the dependency and its resolution and use Google Guice as a kind of factory to create instances and inject dependencies in it. For the creation of the binding, Guice offers a class AbstractModule to subclass from. * Creates an instance of a class. * Class with a reference. * Reference to the service. * Client which requires the data source with injected references. * Let Google Guice create the instance and inject dependencies. Please note, that the data source is using setter-injection for the service implementations and the InjectorHolder as a factory to create an instance of data source with injected reference. After this short introduction of Guice, it is time to package this 3rd-party library into the Eclipse RCP client. In fact it is all about putting the JARs (guice-2.0.jar, aopalliance-1.0.jar) into some folder inside of the client plug-in and modifying the MANIFEST.MF so that the JARs are on the bundle class-path and the packages are listed as “exported”. After the client has the ability to use business delegates it can access the business functionality of the server. In fact this requires that the server is already implemented. In order to decouple the client from the server development, mocks can be used. Mocks are popular in context of Unit tests, but can be used to simulate behavior of server implementation as well. Since mocks should not be delivered into production it is a good idea to put them into a separate mock plug-in, included into the special mock feature. The mock plug-in should export its packages. These should be imported by the main plug-in, instead of defining of a dependency on the mock plug-in directly. The mock feature is included in the product / top-level feature as an optional feature. This specific configuration allows the main plug-in to instantiate classes from the mock plug-in, if this is delivered, but doesn’t produce errors if the mock plug-in is not included into release. 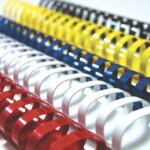 Since the mocks should also be injected by Guice, we define the binding module as well. Using this utility, the main plug-in can read in available AbstractModules available in runtime and configure Dependency Injection. Before the usage of InjectorHolder this should be configured. We use higher priority (bigger number) as a reason to select the AbstractModule. The mock plugin should define a higher priority, which would win against the business delegate, if included into release. 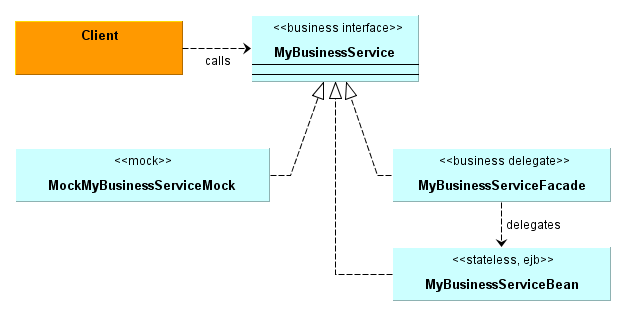 In this article, an implementation approach for business delegates and service locator patterns is shown. Usage of Google Guice Dependency Injection framework allows for a flexible resolution of dependency in client code. Since it doesn’t support multiple binding configurations, we introduce a self-defined extension point, which allows to register different DI-Configuration modules and assign different priorities to them. In addition, we use the ability of Eclipse to define and use optional feature, to foster runtime-based configuration. Using different “Run Configurations”, you can start the RCP client with different implementation of your business services. If the mock plug-in is included, its higher priority will win against the business delegates. Therefore the development of the client can be performed using mock objects instead of real business delegates without any additional configuration. Having this structure, you can model the relationship between two instances of types A and B by an instance of SimpleRelationship<A>. If you want to communicate the creation of a relationship you would put the latter into the relatioshipToAdd list, if you want to model the deletion, you would put it into the relatioshipToRemove list. Coding this result in a type safety warning: A generic array of SimpleRelationship is created for a varargs parameter. Which reveals a problem in a Java language: you can not create an array of parameterized types. And resulting from this fact, you can not use that as varargs argument. Finally, if you want to create convenience methods for one and many items, you have to do it in a old-fashined way, by providing overloaded methods. The Eclipse RCP became a prominent platform for building client software. 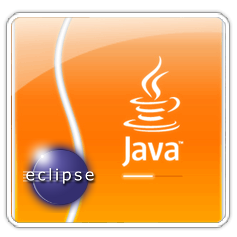 One of the delivery mechanisms supported by Eclipse RCP is Sun’s Java Web Start (JWS). Since Galileo Edition some changes has been introduced in the platform. This article provides some hints for creation of the RCP delivered by Java Web Start. In order to package the RCP I suggest to use feature-based products as described in a previous article. Following it, you should have a top-level plug-in (also refered as product-defining plug-in) and top-level feature, which is called “wrap”-feature in the context of the Java Web Start. Before you start with Java Web Start (JWS), export the product and make sure it starts as a standalone application. In doing so, you have to ensure that your references to the plug-ins are correct. One of the way of doing it is to hit the Validate button in the top left of the product editor. If the validation is successful, try to export the product. The PDE builder will run and create a distribution. The errors of the compiler/builder/assembler, if any, are reported to files zipped to the logs.zip file in the distribution directory.